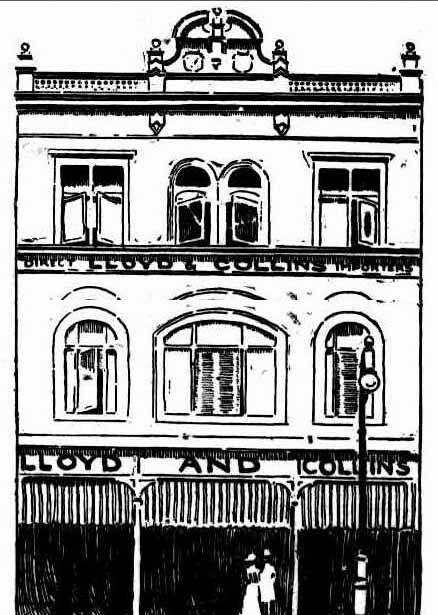 Background: The company of Lloyd & Collins was a partnership between Benjamin Lloyd and Charles Collins and they traded as outfitters, but seemed to have specialised in accessories and fancy goods as well as gift wares, particularly towards Christmas time each year. 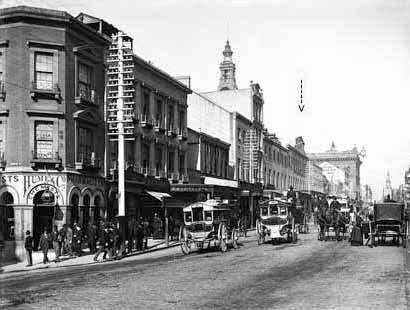 They occupied premises at 306-308 George St, Sydney from at least 1884, but most likely earlier. In 1887 their premises were badly damaged by fire and the matter was considered suspect, as at the subsequent Colonial Inquest the various Insurance companies that had insured the premises and stock were represented by legal council. The insurers tried to make a case that the fire was deliberately lit and suspicion fell on Charles Collins. At this time Collins left the partnership and Benjamin Lloyd continued to conduct the business on his own. Lloyd was successful and made occasional trips to Europe to secure stock. The premises were rebuilt and extended in 1897 and again in 1907 to include 304 George St, giving the company 3 small frontages. The business closed in about 1912 and the property sold with vacant possession in March 1912. Lloyd died in March 1935. 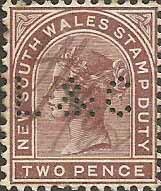 Device: This is a rather rare pattern that is found on both postage and revenue stamps of NSW around the turn of the 20th century. The style of the pattern, with its small neat letters is like that of English patterns of the period, so we would suggest that the device could be from that source rather than being of local manufacture. It is most likely a single die device. The device did not last very long and degraded quickly and in some instances the C is almost entirely made up of blind pins. Background: Frederik Alfred Lohmann was born in Bremen, Germany and first came to NSW in 1891 to try and establish some direct wool purchases on behalf of an Antwerp (Belgium) Merchant Bank and some Continental Spinning mills. In 1892 he established Weber, Lohmann & Co with Arthur Webber and the company traded successfully as an import /export and shipping company, and established branches in Sydney, Melbourne and Brisbane. 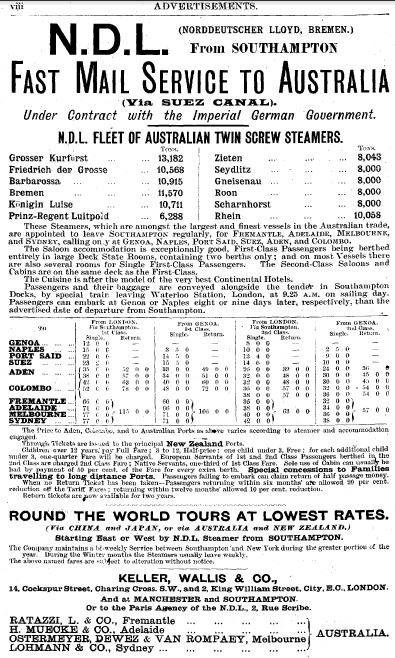 However in 1901 the company were the subject of an expensive legal action when they failed to produce payment for a ship, the SS Ormazan when it was delivered to Melbourne as agreed. Lohmann returned to Germany where he sought financial backing and re established the company as Lohmann & Co (Bremen). He then returned to Sydney to build up Lohmann & Co as a major wool trader. Lohmann returned to Germany prior to World War 1, which was fortunate as many of his management and employees at Lohmann & Co were interned in late 1915 for the duration of the War. Lohmann was President of the Bremen Chamber of Commerce in 1914-15. He died in 1919. 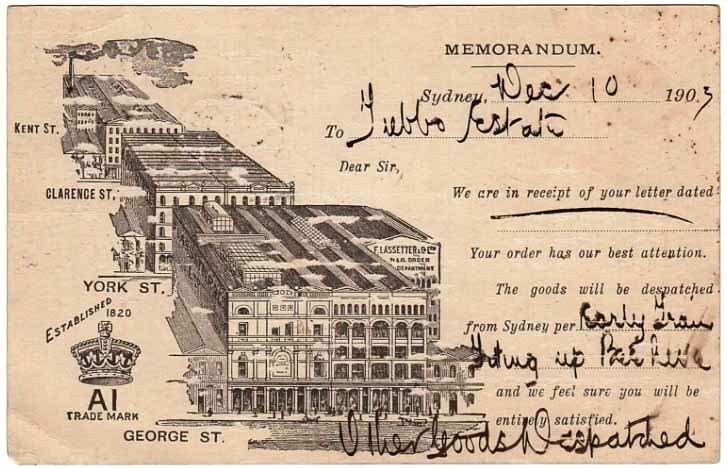 The company Lohmann & Co continued in Sydney after the war and was located at Hunter St. This was most likely under the management of George Waldthrausen who had joined the company in 1909 and whose family became the chief shareholders. The identity of the user of the L&CO.a device was confirmed in South Pacific Perfin Bulletin #102 of July 2013 as Lohmann & Co. Prior to this confirming cover Lohmann & Co had been the most likely user as their company name fitted the letter sequence and that the company was known to have operated in Sydney at the time of the known use of the device. An important additional piece of evidence, albeit circumstantial, was that the cessation of usage of the L&CO.a device mirrors that of the JS/S.a device (late 1914 to mid 1915) and that the activities of both companies were known to have been suspended during World War 1 due to their German ownership. Device: This device is most likely a single die device as it has been shown to produce clear central strikes in stamps of a range of sizes and formats. The device was only in service for about 3 years from 1911 until late in 1914. Over this time it produced clear strikes so it is unlikely that its use was discontinued due to the condition of the device. This fact further supports the case that it was a Lohmann & Co device. Usage on postage stamps is scarce but its use on revenues is rare indeed with few reported examples. Background: *The Legal & General Life Assurance Society was founded in London in 1836 and in addition to offering life cover the company began to loan money to both corporate and individual customers. The company expanded throughout the 19th century and in the 1850s it entered the real estate business, investing heavily in the development of Birkenhead, near London, and other large real estate investments. After the end of World War I and the large number of claims due to war casualties and the influenza epidemic of 1918 the society incorporated and dropped the word "Life" from its name and began writing fire and accident policies. In the 1920’s and 1930’s Legal & General expanded overseas mainly by acquiring existing insurance companies in South Africa, the USA and worldwide with the acquisition of Gresham Life Assurance and Gresham Fire and Accident companies (see G.a). The Gresham mergers were particularly important for the companies operations in Australia and this allowed Legal and General to start to penetrate the Australian market after WW2. The company further expanded its Australia business by entering the Life market and also adding marine insurance in 1949, using Andrew Weir & Company as its agent. In 1960 it acquired Andrew Weir's marine subsidiary, British Commonwealth Insurance and most likely at the same time the Co-operative Insurance Company (see C.I.C..a). By the late 1960’s Legal & General were the UK’s second largest life insurance company and in the 1970’s the company continued to grow through partnerships in Europe. Following a restructure Legal & General ventured into the U.S. market in the early 1980’s but not all of its acquisitions were operating successfully and in 1981 the company decided to terminate its general insurance businesses in Australia. However they continued to grow in the US market and this allowed the company to re enter the Australian market with the creation of a subsidiary with Australian insurer SGIO Insurance to acquire the insurance operations of the South Australian Government, however the company later sold these interests to Guardian Insurance in 1996. Device: This LG.a device was most likely a multi die device of at least 3 dies in a horizontal array. The 3 dies are shown in the reference sheet so as to confirm the spacing between them. The dies are near identical so the pattern is given a single catalogue reference letter. 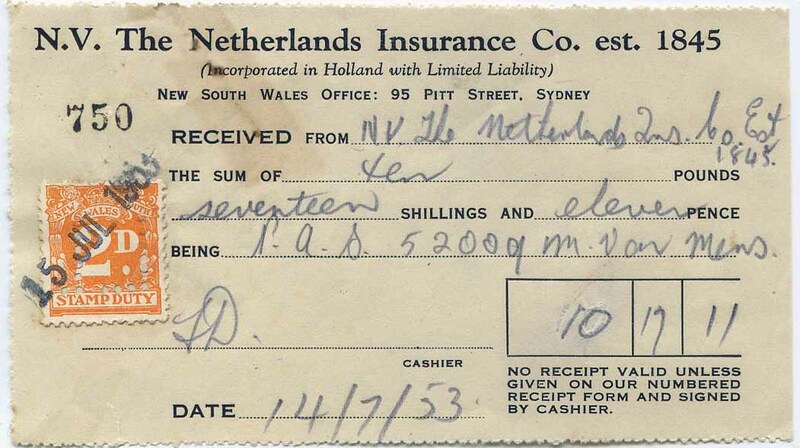 The pattern is only found used on revenue stamps of NSW and its format and style of letters is similar to that of a group of devices/patterns used by sister Insurance companies British Commonwealth Insurance (BC.a) & Gresham Fire and Accident Insurance (G.a). The device was in service from at least 1956 until late in 1966. 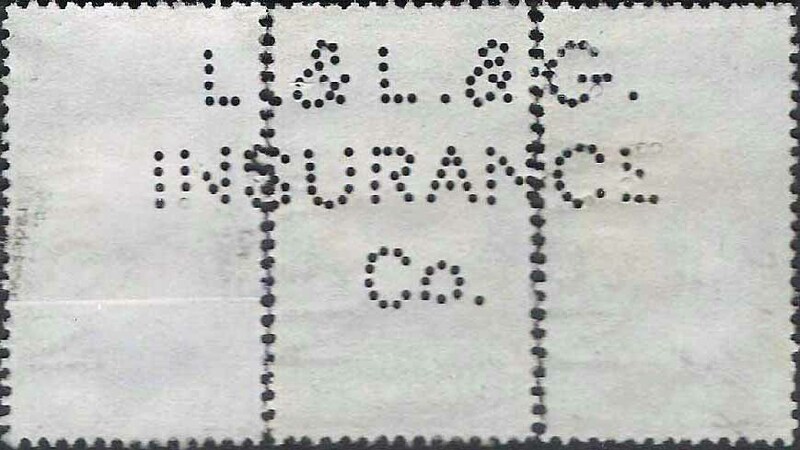 Background: The London Guarantee and Accident Company were incorporated in London in 1869 and the company was established to write Accident cover but in time offered the full range of insurance products with the exception of life cover. Like many other English insurers the company undertook an expansion through out the British Commonwealth during the late 1800’s as well as the USA. They arrived in Australia as early as the 1880’s and established branches in most State capitals. In 1907 Phoenix Assurance attempted to acquire the company because they lacked a specialist Accident insurer and it was a quick way to access the growing US market in which London Guarantee and Accident already had a presence. However the acquisition could not be finalised. In 1922 Phoenix Assurance Company again tried to acquire London Guarantee and Accident and this time they were successful, however for a number of years London Guarantee and Accident continued to trade in their own name. Unfortunately the acquisition did not prove successful and Phoenix had to sell their recently acquired interest in Norwich Union Fire. See NUF.a. Device: This LG/A.a device is most likely a single die device. 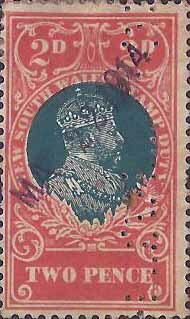 It has a large die and therefore it is quite often found as a partial, even on the large format Edward VII issues that it is most commonly found on. Company cachets indicate that the device was in use during the mid to late 1920’s. 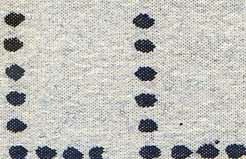 This pattern is more commonly reported on revenue stamps of NSW but is also rarely found on postage stamps of Australia. Background: *The London and Lancashire Life Assurance Company was established on 4 August 1862 as the company was incorporated on 15 June 1910 as the London and Lancashire Life and General Assurance Association Ltd. This company did enter the Australian market but left it in 1889. 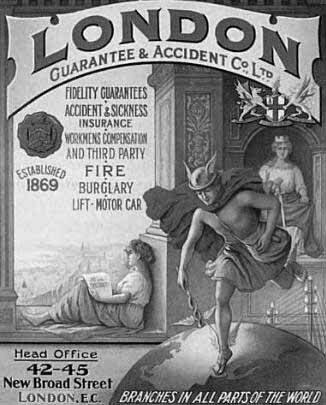 In 1867, a sister company, the London and Lancashire Fire Insurance Company, was established and the two companies shared premises in Liverpool before the London and Lancashire Fire Insurance Company moved its head office to London. 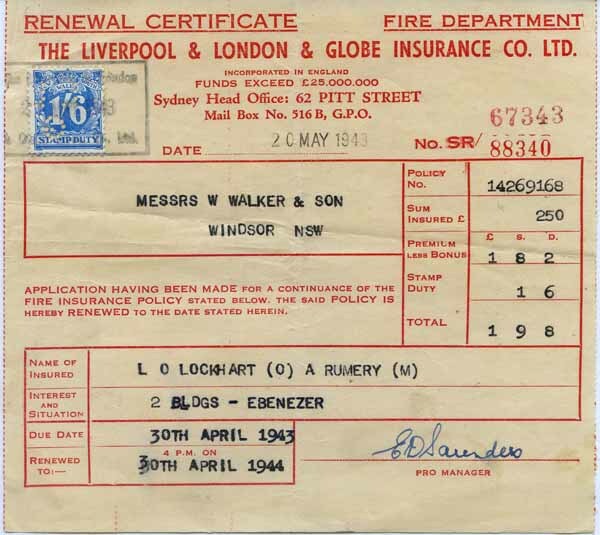 London and Lancashire Fire Insurance Co expanded into the Australian market with the take over of the Colonial Mutual Fire Co Ltd in 1898 although the companies continued to trade under their own names until a formal take over was effected in March 1927. (See CM/CO.a) In 1912 (some sources 1908) the company also acquired the Derwent and Tamar Assurance. (See D&T.a). 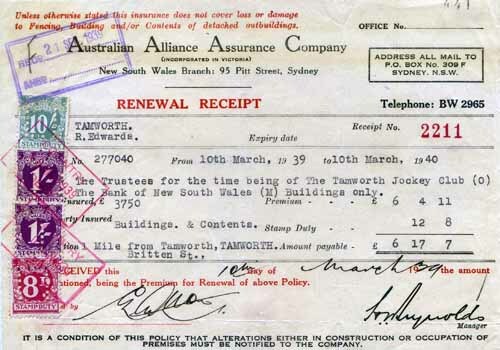 From 1910, the company started to transact fire, accident, employers' liability and general insurance and in 1911 they acquired the Australian Alliance Assurance Company. (See AAA/CO.a). In 1923 the parent company was itself acquired by the Northern Assurance Company Ltd, which in turn became part of the Commercial Union Assurance Company Ltd in 1968. From 1963, the company wholly re-insured its accident insurance account within the Northern & Employers Group and, in 1971, transferred its life business to Commercial Union. London & Lancashire was dissolved on September 4 2007. Device: As with the LG/A.a device above this LL.a device was of a large format and clearly intended for use on the contemporary Edward VII revenue issues. It is most likely a single die device as multiple strikes do not show consistent separation. Also the pattern is most commonly found in positions 2,4, 6 and 8 on these Edward issues and therefore parts of other strikes would be visible if it was a horizontal format multi die device. 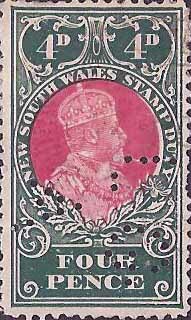 Shortly after the devices introduction in 1929 the NSW revenue stamps changed to the smaller format Numeral type and this presented a challenge to the user to fit such a large pattern into these smaller format stamps. The pattern is more commonly found in positions 1, 3, 5 and 7 on these numeral issues. 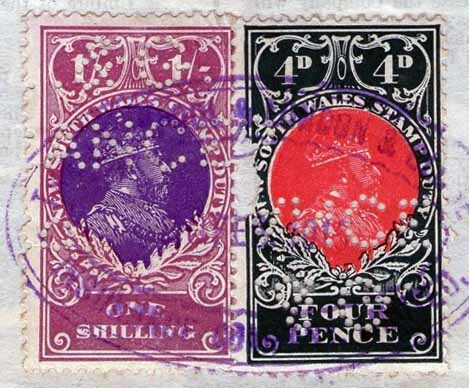 Due to the size of the die partial strikes are common as are multiple partial strikes on the same stamp. This pattern is also found used on postage stamps although this usage is less common and covers only the period of 1929 until about 1962. Late use of the device in the 1960’s often show missing or blind pins and it is clear that the device was deteriorating up until it was withdrawn from service in 1965. Netherlands Insurance Co using LL.a perfin. 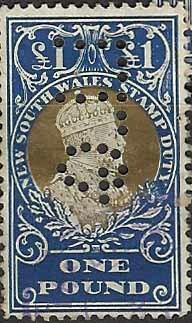 Device: Little is known about this device/pattern and it is only rarely seen on either the revenue stamps of NSW and postage stamps of Australia. Given there are so few examples known there is not much evidence to build on. In fact the authors have not seen a complete strike as all examples we have seen are partials. 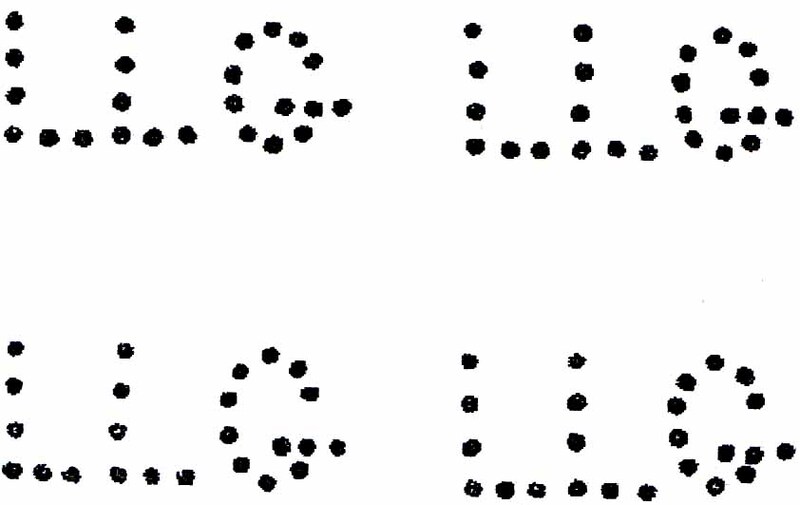 We have been able to build up the pattern image from these various partial strikes and we have had to estimate the location of the top most pin of the second L.
The pattern is very similar to LL.a and it is possible that LL/Co.a had the same user and perhaps is indeed the same device as LL.a. This LL/Co.a device was used sometime in the late 1920’s and this predates the LL.a device. LL/Co.a was most likely a single die device. Background: *The Globe Insurance Company was established in 1803, writing fire and life insurance in London. The Liverpool Fire and Life Insurance Company was formed in 1836 and in 1846 they acquired London interests and offices and became the Liverpool and London Fire and Life Insurance Company. 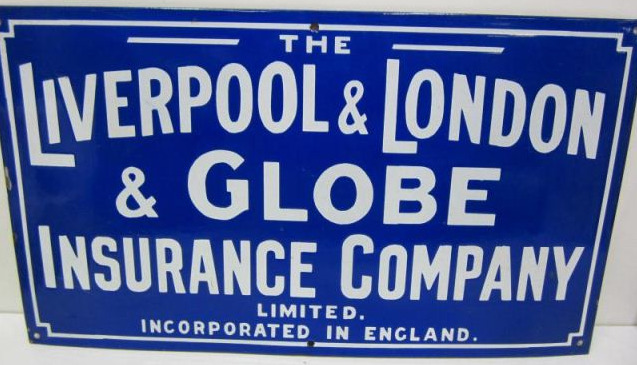 In 1864, the two companies merged to become the Liverpool & London & Globe Insurance Company. The Liverpool and London Fire and Life Insurance Company had commenced operations in Sydney in the 1850 and in 1851 they acquired the ‘Australian Colonial and General Life Assurance Company’. After 1864 they became the Liverpool & London & Globe Insurance Company and they expanded slowly from their Sydney main office and later established offices in Tasmania and Western Australia as well as Brisbane in 1911. In 1919 Liverpool & London & Globe was acquired by Royal Insurance in what was, at the time the largest merger in British Insurance history. However the Liverpool & London & Globe continued to operate under its own name until well into the 1960’s. This merger was a trend that was to continue across the Insurance industry throughout the 20th century culminating in Royals merger with Sun Alliance, itself a product of mergers between the Sun, Alliance, London and later Phoenix Insurance companies. The resulting company Royal Sun Alliance was formed in 1996 and later in 2008 was rebadged as RSA Insurance Group with its headquarters in London. As part of these changes the companies activities in Australia and New Zealand are restructured under the Promina Brand and the General Insurance arm is renamed Vero. Device: The LLG. a .b .c and .d device was a four die device in a 2 x 2 format that was located at the companies Sydney office. The patterns produced from this device are very distinctive with the large diameter pins making correspondingly large holes. Each of the four dies produce an identifiably different pattern, so accordingly we have assigned a pattern reference to each die. 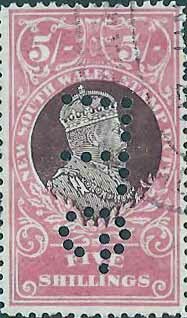 The patterns are large and the device was clearly intended for use on the Edward VII revenue issues and the large format KGV/Kangaroo postage stamps of Australia. 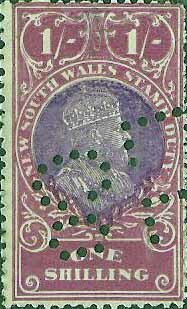 When seen on these issues and postage stamps it is almost always found in positions 2, 4, 6 & 8. The patterns are found on both the revenue stamps of NSW and postage stamps of Australia over the period from 1921 until around 1930. The device was not suitable for use on the smaller format Numeral revenues and the company replaced it with the smaller format LL/G.a, .b, .c and .d device. (see below). Device: The LL/G.a .b .c and .d device was a four die device in a 2 x 2 format that was located at the companies Sydney office. This device replaced the LLG.a .b .c and .d. 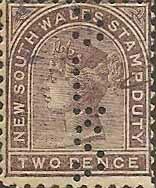 It would have been sourced as the format of revenue stamps was changing with the advent of the NSW numeral series, which were much smaller than the bi colour, Edward VII issues. The usage of the devices overlaps in the late 1920’s and early 1930’s. The four dies/heads of the LL/G.a .b .c and .d device are fairly similar but they each have subtle pin position variations that makes each pattern distinctive, variations particularly in the cross bar of the G.
LL/G.a Inside and outside pins slightly higher than centre pin. LL/G.b Outside pin is higher and closer to centre pin. LL/G.c Cross bar has 3 pins straight. LL/G.d Inside pin is lower others parallel. The device is found used on the revenue stamps of NSW and the postage stamps of Australia from 1929 until at least 1951. On postage stamps but the usage extended until at least 1960 on revenues. Device: This device was most likely designed for use as a cancelling punch for documents rather than a perforating device for stamps. 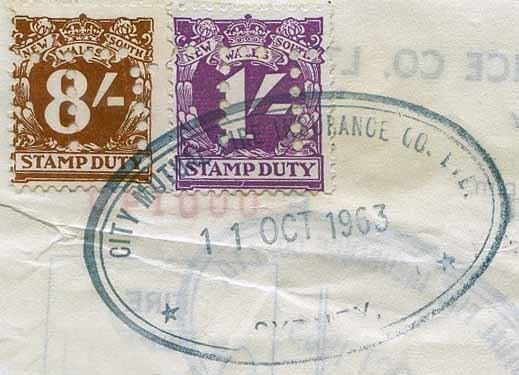 However despite the scale of the device making it suitable as a cancelling device it was not used in this manner on revenue and postage stamps and evidence from stamps on documents (see below) show that the stamps have been perforated prior to being affixed to the document. This is consistent with the device being used as a true perforator. 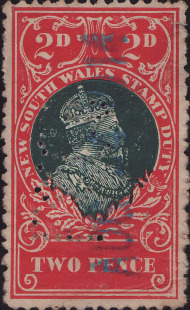 It is first found used on both the revenue stamps of NSW as well as the postage stamps of NSW and later Australia, at the Sydney office from about 1907-1919. Due to the size of the pattern these are always found as partials. In about 1919 the device was moved to the Brisbane office. The use in Brisbane is much rarer and oddly it only produced strikes of the single word ‘Insurance’. It may be that the device was altered prior to its movement to Brisbane or that it was damaged in transit, or indeed that modifications were made in Brisbane. 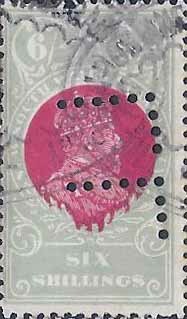 This 'Insurance' pattern is only found on the revenue stamps of Qldbut may have been used on postage stamps as well, but this has not been reported. 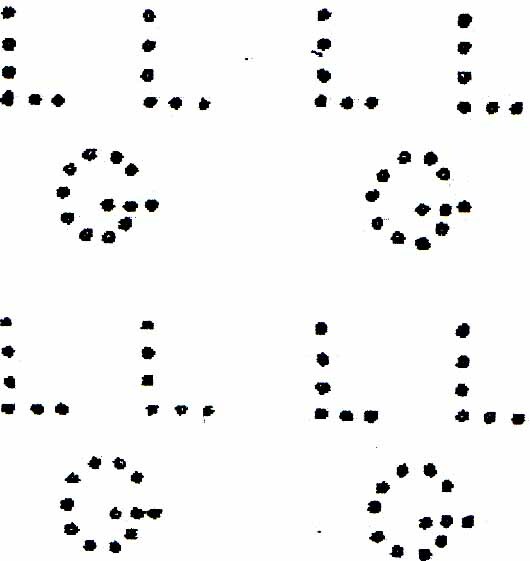 The usage is short lived and in about 1920 the Brisbane office started using the LLG.a (Queensland) device. In Sydney this device was replaced by the 4 headed LLG. a .b .c and .d device. Background: *Frederic Lassetter was born in December 1828 at Taunton, Somerset, England, son of Matthew Lassetter (d.1887), Wesleyan minister, and his wife Elizabeth. In 1832 the family migrated to Sydney where Matthew became a confectioner and pastry-cook. In 1837 he accepted an offer to move to Longford, near Launceston Tasmania, and in 1842 opened a school in Launceston. Soon after his wife died he left his family and went to America. In 1845 Frederic moved to Melbourne and worked as a sales clerk for the auctioneer, William Easey. There he met visiting Sydney businessman G A Lloyd who in 1848 (approx) invited him to join his Sydney firm. Lassetter joined Lloyd and gained experience as an accountant and in June 1850 he joined L. Iredale & Co Ironmongers that had been established in George Street in 1820 by Lancelot Iredale. 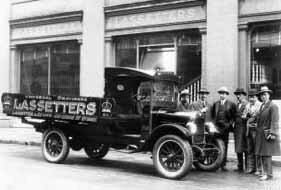 Lassetter revitalised the business, beating its competitors to buy goods from incoming ships by arranging for early receipt of signals and having a horse and cart and rowboat constantly ready. In addition he gained benefits from trading on the goldfields with large loads of goods. Lancelot died in 1848 but his sons Robert, Tomas and later George all joined the business and later, in 1861 they were joined by Lancelot (junior) grandson of the founder. In 1852 Lassetter married Lancelot Iredale's daughter, Charlotte Hannah. In September 1863 (some sources 1862) the existing partnerships was dissolved and the company became F. Lassetter & Co. and moved to large new premises in George Street. The company became a limited company in 1878 and by 1890 was one of one of the biggest hardware firms in Australia, with additional properties in York and Clarence Streets. In 1894 the George Street show rooms were expanded and came to occupy much of the western block between Market and King Streets, and at this time Lassetter remodeled the company as General Merchants or Universal Providers as they were known. To aid country sales the company produced complete catalogues of their goods, growing to over 1000 pages and circulated these throughout Australia. By 1910 the company was one of the largest businesses in Sydney with nearly 1000 employees. Lassetter died of a stroke in September 1911 and was survived by his wife, four sons and two daughters. Frederic’s son, Henry (Harry) Beauchamp (born 19 March 1860) was educated in England and had a distinguished military career before becoming Managing Director in 1911 but in 1915 he returned to England and took command of a Territorial Brigade. Promoted Brigadier-General, he was appointed C.M.G. in 1917. He returned to Sydney in 1924 and died on 17 February 1926. Frederic’s other son Arthur was also involved in the business. In May 1926 about 3 months after Harry’s death the family decided to stop trading and its entire stock was purchased by competitor and fellow Universal Provider, Anthony Hordern & Sons. By 1933, the George Street showrooms had been taken over by hardware retailer, Nock and Kirby. Device: The L/S.a device was a multi die device of at least 2 dies, but most likely 3 dies in a horizontal array. The dies are very similar and accordingly we list the pattern as a single pattern. The examples we have seen show two consistent spacings of patterns between multiple strikes and this supports the device having at least 3 dies. The device came into service as early as 1895, possibly earlier, and remained in service until at least 1904, so usage of L/S.a and L/S.b seems to have overlapped. 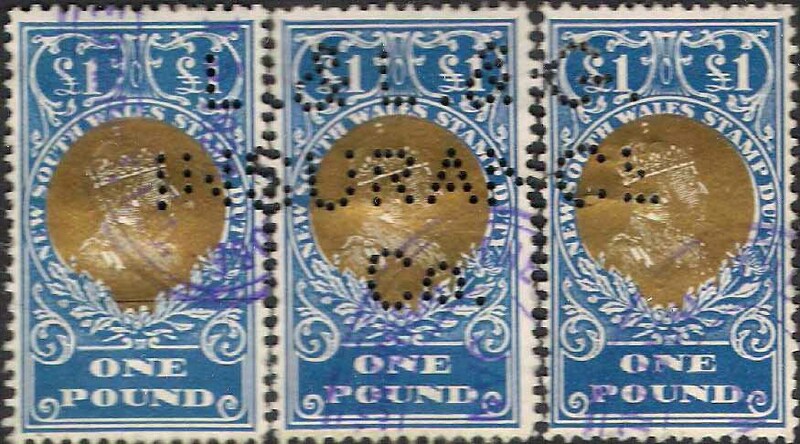 The pattern is often found as a partial and indeed many examples show multiple strikes on a single stamp suggesting a rather haphazard puncturing regime which is understandable given the high volume of mailing that the company undertook. 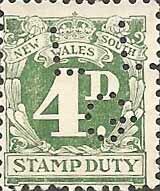 The pattern is found on the revenue and postage stamps of NSW but revenue use is much rarer than postal use. Device: The LS.b device was sourced from the perfin device manufacturer, Slopers in England in November 1902 and was a multi die device of 12 dies in a 6 (horizontal) x 2 (vertical) die format. The dies were essentially identical, which is consistent with a high quality manufacturer such as Slopers, but there are slight variations between some of the dies. Because the dies are essentially the same we list this as a single pattern despite its multi die format. To date there have been too few multiples sighted to establish the exact location of the subtly different dies within such a large device. Use of the device seems to overlap with that of LS.a but it is clear that the purchase of the LS.b device was intended to replace the LS.a device as this overlap of use is only for a year or so. 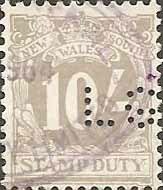 The pattern is found on the revenue and postage stamps of NSW as well as later on the postage stamps of Australia over the period 1903 until at least 1924. As with LS.a, usage on revenue stamps is much rarer than postal use.